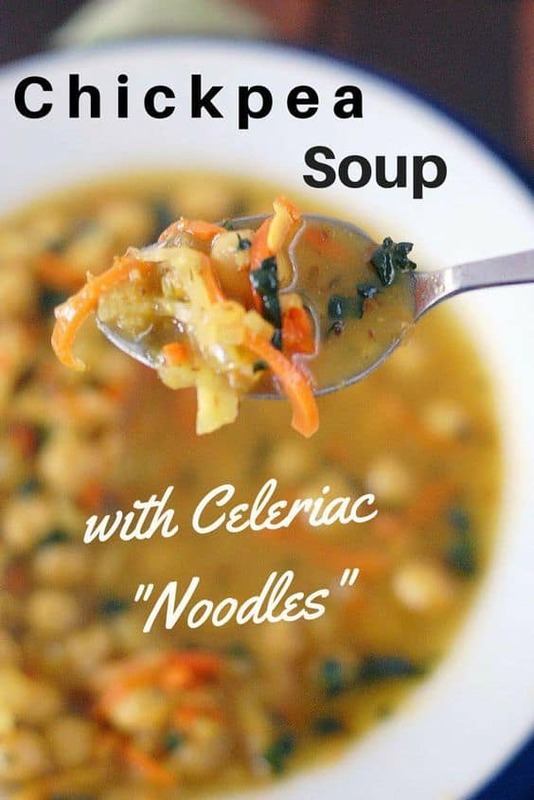 Chickpea Noodle Soup with Spiralized Celeriac Will Hit the Spot! My Chickpea Noodle Soup actually has no real noodles in it at all. Instead, it’s overflowing with noodle-thin strands of celery root and carrot. I think that alone makes this an over-achieving veggie soup. If you have a spiralizer, this recipe is a great excuse to get it out. If you can’t find affordable celeriac, you could do carrot or zucchini noodles instead. 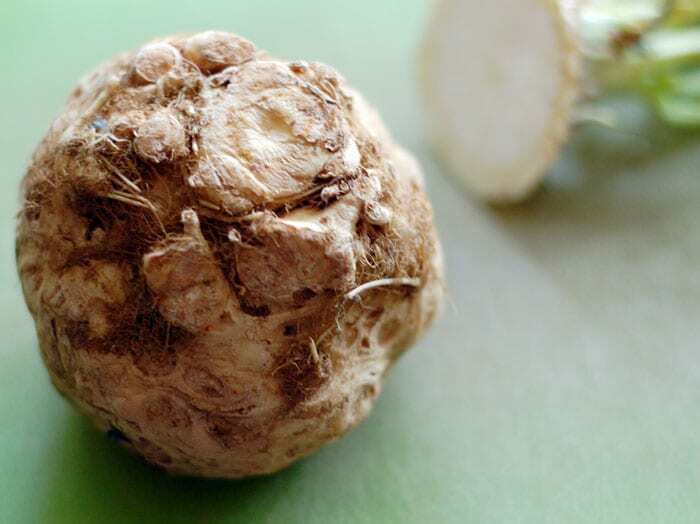 It’s sometimes called celery root, but it’s not the actual root of the plant we call celery. However, it does have a very mild flavor similar to celery and comes with the extra added bonus of being string-less. It also makes a tasty substitute for mashed potatoes too if you want to give that a try. If you just see it on your grocer’s shelf you might pass it by. It’s extremely weird looking. Gnarled up, furry with course hair-like roots and so bumpy it can be hard to peel. Don’t judge this veggie by looks alone – the flavor and texture are wonderful. 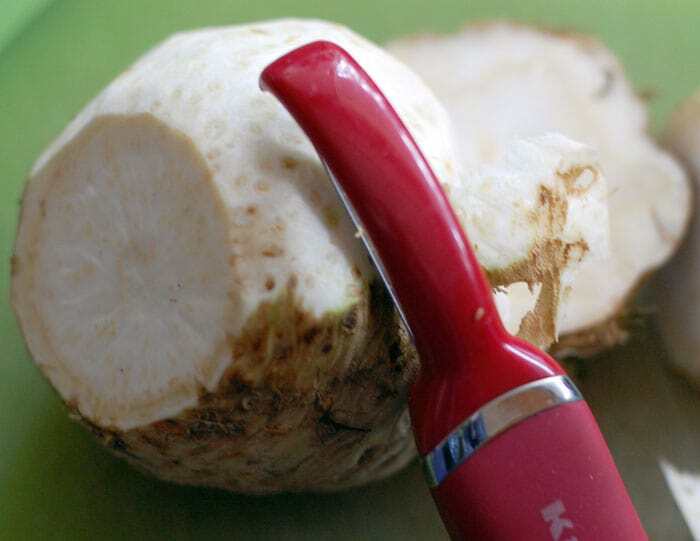 Is Celery Root Hard to Peel? Believe it or not the celery root pictured above is actually more uniform and easier to peel than most. I even got it at a chain grocery so it was pretty cheap too. Make sure to weigh your root first if you are paying by the pound. I got an $8 one at Whole Foods before – ack! This one was about $3. How Do You Spiralize Celery Root? Once you’ve cut the end off the celeriac or carrots, peel, then create the noodle shapes with a spiralizer or julienne peeler. 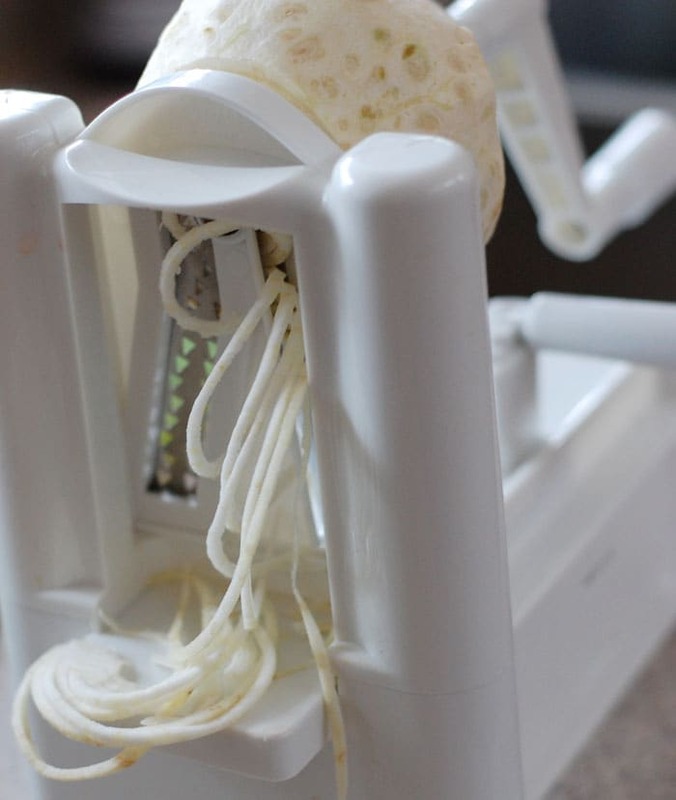 I’ve linked to the Paderno spiralizer that I have pictured above. It gets the best reviews and I’ve been very happy with it so far. I had to work much harder to get the celery root noodles, so make sure that you’re pushing in as you turn. Close to the end I had worn little grooves in the root on the side that was attached to the handle. I took it off and turned it around so the spikes could get a grip again. This worked and I was able to make noodles out of almost the whole root. While the strands above are long – even though I broke them apart a little – stirring the soup broke them up into a more soup sized noodle. Even though that happened, the veggie itself does not get mushy. I love the texture of this soup and ate 2 bowls of it for dinner. I didn’t let Cheryl take the leftovers to work either. They’re all mine! Here's a gluten-free, soy-free noodle-less vegetable noodle soup. The noodles are actually spiralized veggies! Use the spaghetti sized blade on a spiralizer or use a julienne peeler tool to make the noodles from the celeriac and carrots. Celeriac takes some concentration to spiral, but just keep pressing as you turn and you'll make it through just fine. You will use about 3 cups of the celeriac and all of the carrots later, save the rest for another soup or use in another dish. Heat the olive oil or broth in a soup pot over medium heat, once hot saute the onion until translucent. Add the garlic and saute another 2 or 3 minutes. Add the water, chickpeas, bouillon, thyme, marjoram, smoked paprika, turmeric and rosemary. Turn the heat up and almost bring to a boil. Add the celeriac and carrot "noodles", hen cover and simmer over medium-low until the veggie noodles are tender about 15 minutes. Before serving stir in the nutritional yeast and add salt and pepper to suit your taste. The amount of salt will vary depending on the bouillon you use. I like to throw in some chopped kale right before serving. The warm broth will soften it, but it won't get mushy. If you have a picky eater it's the mushy that seems to bother them the most about greens. I just got a spiralizer too! I’m looking forward to trying this. And thanks for the advice about weighing the celeriac before purchasing–that’s happened to me at Whole Foods as well. BTW I am loving your Oatrageous Oatmeal Cookbook! I’m so glad you like OATrageous, be sure to let me know what you make. And look forward to more spiralizer recipes! I just made this soup. I was missing the root so I just added some boiled regular noodles and it was incredibly tasty! Thank you for the recipe. I will be doubling it and making it regularly. I’m so glad you like it too! It was this recipe (and the photo) that made me finally read up on nutritional yeast. Long story short, I bought the yeast, made this soup, and it was wonderful! 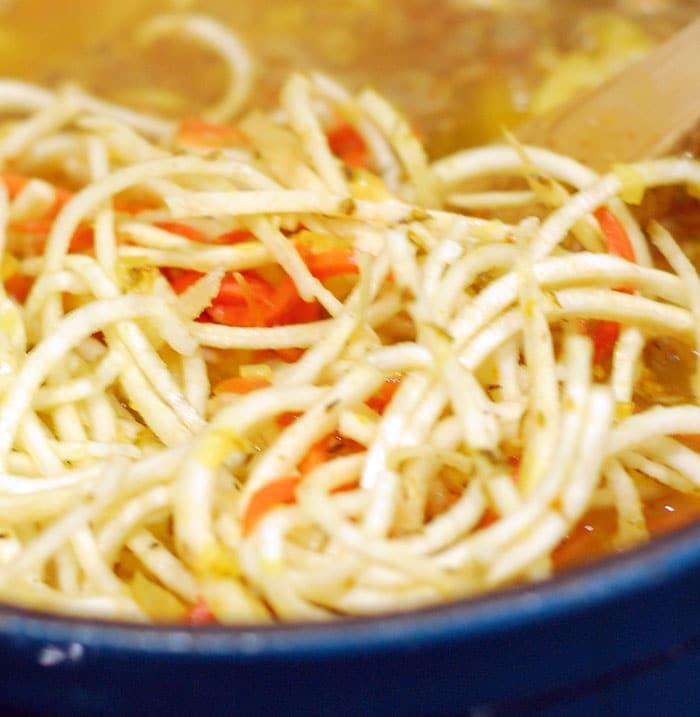 I’m new at spiralizing, but I’m loving it, and this soup has in it everything I love. Thanks! Delish!! Great recipe. Will make again. 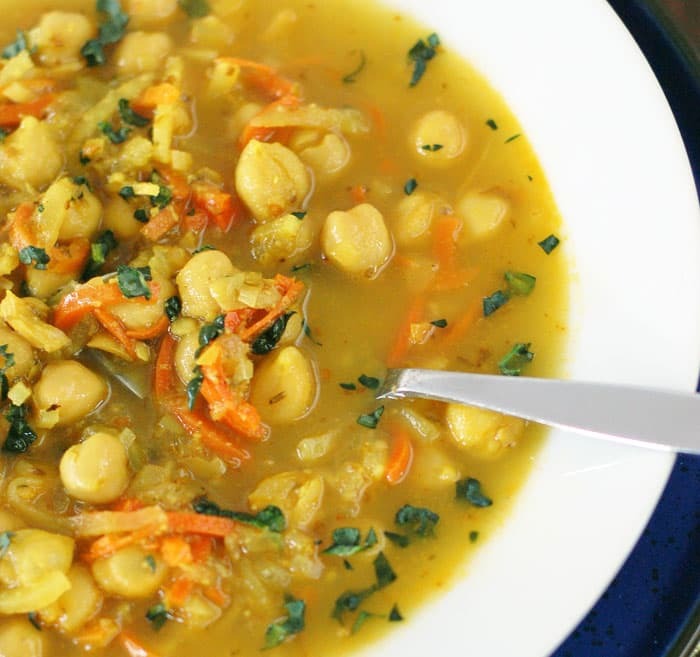 This is one of our favorite soups! I particularly love the spice combo. This time I made it from store-bought spiralized carrots, butternut squash, and zucchini in the Instant Pot for 3 minutes, then added the nutritional yeast at the end.